Our experience with eco-friendly coatings gives us the knowledge to advise you on how to go green intelligently. Many of the new low VOC coatings are superior to their predecessors. But some have limited effectiveness and others are extremely expensive. Most of the eco-friendly products require a little extra knowledge and patience for successful application. Our experience enables us to customize a “go green program” for your painting project. Almost all products have an impact on the environment, but these eco-friendly products were designed to reduce that impact while delivering high-quality results. 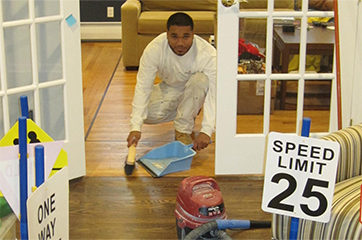 Fairfield Painting Company makes painting easy. We keep appointments, and return phone calls, e-mails and texts. We get in and out quickly and professionally completing jobs as promised. You and your property are treated with respect.